Should A Dog Have Possessions? He has become rich beyond the dreams of avarice, and it has – I can categorically confirm – made him unhappy. This is not the first tale of a bone which has been connected, here in these cyberpages, with Macaulay the Dog. But it is a living, whimpering metaphor; a shadow on the creature who has always been such a happy-go-lucky surfer of life’s waves. Possessions, mark my words, do not always make one happy. On Sunday evening there was a ring on the doorbell and there stood our kindly dog-friendly neighbour. She had with her a lamb bone. It was huge. Enormous. And delighted, we took the bone and introduced the dog to its rancid charms. Was it naive to expect a twinkle in the eye, a jauntier gait as those paws clattered out into the garden, carrying jaws bearing gifts? Because the dog was not joyful on receipt of this grail. Rather, imagine an old miser who has mined every day for at least 100 years to find a nugget of gold; and at last, when he is far too old to benefit properly from it(Las Vegas, limousines, all-night parties) he happens upon the thing he has always wanted. And once he holds it in his hand, the fear of losing it is almost overpowering. Macaulay the family dog chewed long and with sombre seriousness, out there in the garden. And then he took the huge lamb bone and buried it deep,coming back with a prospector’s moustache filled with compost from the chosen hallowed flowerbed. But once in, he couldn’t settle. He was worried, deeply concerned. He stood at the window and whined because he knew – with a certainty bordering on the obsessive – that some creature out there wanted his bone, and they were going to dig it up and bear it away into some shady netherworld inhabited mainly by foxes and the odd feral cat. Now, like his precious, he keeps it close to him at all times, except when some horrified human resident of the house finds it being gnawed on a duvet, or possibly with the new carpet as a tablecloth. We find the bone in any number of places, and few of them are the right place for something which should by rights be pushing up the daisies. Until the lamb bone came into his life, Macaulay did not know that a possession such as this could change things utterly. But he is a different dog, a furtive, fretting thing, in thrall to pieces of the leg of something else. Maybe we should enrol him in a monastery where he can eschew worldly goods, and remember what it is to stand in just the fur you were born in, and smell the cow dung on the wind. Or possibly a collective, a kholkoz, where Macaulay’s bone will be shared amongst a small working group of dogs, some of whom are more equal than others. Posted in Macaulay The Dog storiesBookmark the permalink. I can see collectivisation being forced on dogs with bones in a Stalinesque nightmare scenario. Poor Mac. Let us hope he escapes Siberia. Poor Mac. At least my Annie cherishes only machine-washable “babies” which are carried outside, to be dutifully retrieved at a later date. But then, she has never received a gift as magnificent as that lamb bone. That bone would bring out a side of Annie I’ve never seen, as it has in Mac. Any dog would cherish it. Our Ruffy and his tennis balls needs rehab too! as perhaps some of their humans! In the middle of unpacking our moving boxes from the states, I felt you were talking about my earthly worries as much as of you dog’s! Loved it! To be honest, Solveig, it taught Phil and I a lesson. We live in a very modest three storey end-of-terrace and after watching Macaulay I consider us fortunate indeed. Ah, but to quote an old Irish poet, All is changed, changed utterly; a terrible beauty is born. Hahaha! From the Hobbit to Animal Farm in a single post. You rock! This is exactly what the culture of things feels like to me. The more I acquire, the greater my misery and guilt. It is a tiny metaphor, right in front of our noses, Rob, but it explains to me why I might indeed be fortunate to have not very much. We have a commercial for a bank that has this story line. It’s about a dog and his bone which he neurotically protects. He moves it from one burial place to another always watching from a window fearful someone will steal it until the day he digs it up and takes it to the bank for safe keeping. It’s really a funny commercial but now I can see the reality! Possibly you’re referring to this commercial? http://youtu.be/lk2B8988ws0 the way Kate describes Mac’s neurosis with his beloved lamb bone, that dog in this commercial could be him. Yes, that’s it! I never realized that dog’s were so protective! I think that dog is the Laurence Olivier of animal actors though. I love that commercial. It’s fabulous, Kate and and Virginia, thank you! Indeed, it could be Mac himself. Though the dog is clean and does not seem to elicit any olfactory discomfort in those nearby.The banker might refuse Mac entrance to his pristine moneyhouse. Mac does harbor quite an appreciation for things smelly and dead, Kate. He nurses them, Virginia. He positively cultivates their micro-civilisations. A tip if you ever meet him: steer clear of the moustache. This old man came rolling home . . .
Don’t know why these things come to me, but, poor old Mac and his boney story made me think of it. I’m enjoying the thread of comments almost as much as your story, Kate. It seems the perfect rhyme for the occasion, Penny 🙂 And the thread? Well, I like to think we have a high class of commented here. And get them going on dogs, and they could talk forever. Hi Carrie! Indeed. It was only a matter of time. Hope you’re well – how’s the second book coming on? Hope all is well with you, too! What pair of bubbles this sets! The penalties of wealth, indeed! Quite. Macaulay has forsaken the Have-Nots and become a Have. Though, to be fair, I think he might have lost the bone this evening. There are advantages to being not very bright. The usual pattern of squandered riches. Perhaps he will return to normal, now. It’s sad, but with a couple of cats hanging about, watching and waiting, I can see why Mac is nervous. One of my dogs buried his dog biscuits under the sofa cushions. Perhaps that would work for Mac. 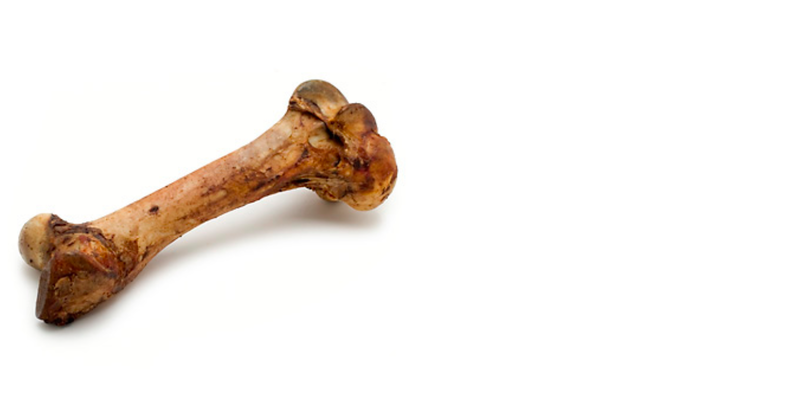 Can lamb bones buy happiness? Kate Shrewsday shares the cautionary tale of Macaulay the Dog and his newly acquired wealth. He does, Gale, and I have never seen him so jealous. The cat got short shrift yesterday evening when he went within sniffing distance of the burial site! In answer to the question, Maggie has a basket full of toys and rides shotgun in my truck. That makes her “people”. Such an incredibly wise man, Steinbeck. I had totally forgotten that quote, Jackie. You have inspired me to get the book out and start it all over again. Thank you! Gabrielle, it can get distressing. the bone is old and rancid to human noses. However, he loves it so that the thought of sharing it with the household is just too much for him. He sits like a miser in the flowerbed, and does not bring it in in case one of us steals it. Dear Mac, the joys and sorrows of life are all to be fully experienced. Continue on this path and show the family the richness of the dogs life. Life’s a veritable roller coaster, Sidey, from which we can not protect our loved ones, no matter how much we try. Hi Hope! I’ve always had a few problems with that quote myself: perhaps Mac and I share a hoarder’s heart. I hope I could drop everything and follow if I were ever asked to. I hope. I’ve never thought about this quote in the sense of “dropping everything and follow”. I think of it in the sense of what Joy Gresham asked C.S. Lewis in Shadowlands. They are out enjoying their honeymoon during her remission from cancer. She looks at him and asks “Is it worth it?”. He responds “Is what worth it?”. She replies “The joy now is part of the sorrow then, that’s the deal”. I saw this movie when my Father was dying from cancer. My heart immediately lept with “YES, it is worth it!!”. It changed my perspective completely. We have the choice to hide our hearts away and keep them safe, or set them free to love knowing the joy now is part of the sorrow then. May you be blessed with a heart free to love!! I often use the monastery line on my kids when they’re acting the same way. It’s my impression that dogs are better at working through these crises than we are, although if your duvet is suffering, then by all means. It is a week later and he is no less fixated, alas, Bronwyn. Time will tell. Poor guy – tough to be so wealthy and yet unable to sleep peacefully at night for worrying about his wealth! Gwynn spends the first 10 minutes of gaining a new tasty posession running around the house crying, clearly a sign that he understands the grief that comes with acquisition, but is unable to, as Elsa says, ‘let it go’. It must be a dilemma they all share, Lexy. What a metaphor! I guess we really are all animals at best. Most humans also seem to find it hard to just enjoy the moment and then move on to enjoy another day. And we are fairly good at hoarding. Maybe next time I’m in that frame of mind Mac and his compost-crusted whiskers will come to mind and I’ll do better. I do love that dog, though! Oh dear, Mac has a touch of the human condition. I fear he has, BB. Tough being rich. “… in thrall to pieces of the leg of something else.” Brilliant turn of phrase, there. Poor Mac. I know, Cameron. There seems to be nothing we can do to ease his distress, unless of course we take away the lamb bone. Now there’s a though! What Mac needs is another dog…hmmm….